We hate Herons. Nothing about them is good, they’re on the menu nowhere. Crack of dawn and I can see a great big heron standing still by our lake. These effn birds eat 10 pounds of fish a day so it’s always a constant battle to chase them away. Herons, at least our visitor was very friendly and let me get 15 feet from him where he eating yet another of my goldfish. The thought crosses my mind to grab a firearm and pop him. The heron takes off and the 7 inch fish is flipping. I pick it up and try to revive by holding it in the water to get some water into its gills. No luck. 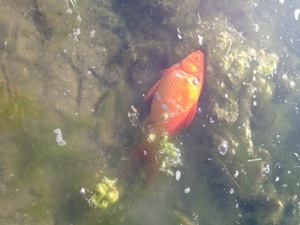 Dead fish. 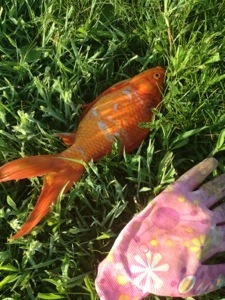 Walk a few feet and there is another giant goldfish, deader than dead. 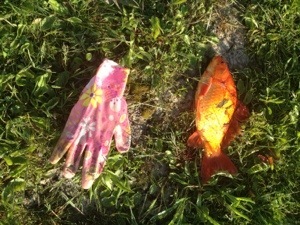 Now I don’t know how long it takes a fish to grow but these two were pretty old, and pretty to boot. My kids stocked the lake with 50 minnow sized ones 7 years ago and they’ve been doing what fish do ever since. These fish were so fat, likely getting ready to spawn. Set my kids glove by them to give you an idea of the size of his meal. No doubt the heron will be back for breakfast.